THREE FORKS—Recent water samples taken in Three Forks showed that arsenic levels were more than six times the recommended federal limit in one of the four wells that feed the town’s distribution system, according to information from the Gallatin City-County Health Department. SHERIDAN - On Sunday July 15, the Sheridan Public Works Director Curtis Green contacted Mayor Bob Stump to inform him that the potable water storage tank level had dropped to a critical level. The storage tank was barely half full and that level would be inadequate to support any structure firefighting efforts in the town. TWIN BRIDGES – The installation of a new council member, water, a potential curb, sidewalk and storm sewer system and the Walker fence issue dominated the Twin Bridges town council meeting on July 10. 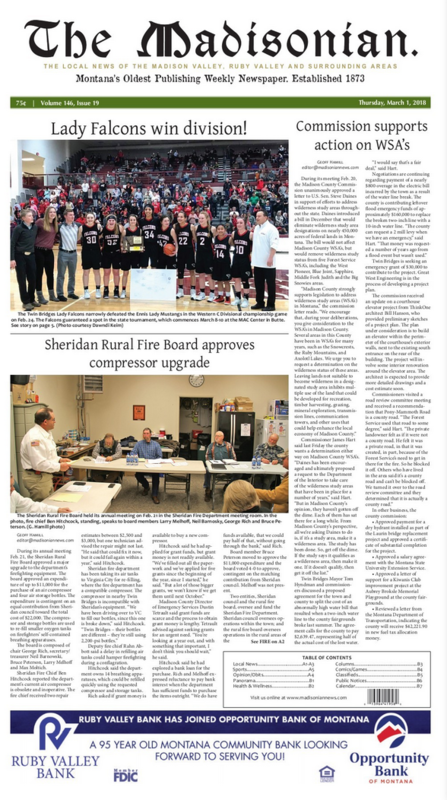 SHERIDAN – Despite all the water coming off the mountains from snowpack and abundant spring rainfall, just one of Sheridan’s five town water wells is producing water. As a result, water projects were front and center on the Sheridan town council’s June 12 meeting.